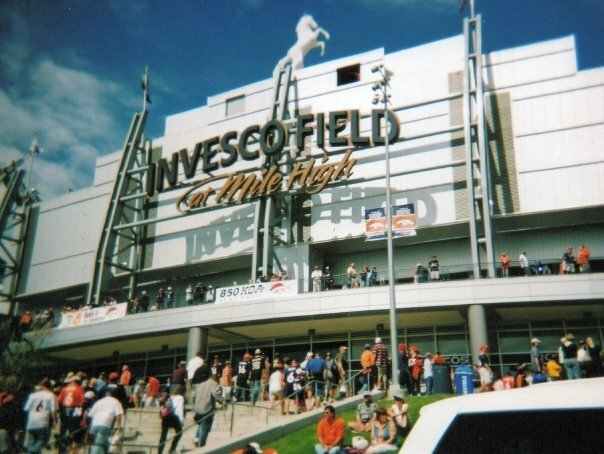 The home of the “wild” Denver Broncos and their fans. The late country singer John Denver was definitely onto something when he composed his hit song “Rocky Mountain High.” As the melody soars in support of his soul-searching lyrics, you can just sense the vastness and beauty of the Rocky Mountain range. Surrounded by an unending sea of blue sky, jagged white peaks of sparkling snow, and a golden blanket of rolling foothills, it is little wonder that the song’s weary traveler forgets all his cares. He has found peace and rebirth, like the relief that comes with arriving home after a hard day’s work. While some would argue that “Rocky Mountain High” speaks to the landscape of Colorado away from the confines of its state capital, Denverites might have something to say to counter that notion. Indeed, there is vastness and beauty to be found as well in Denver. And, after just one quick visit to the “Mile High” city, you too could be feeling at home and flying high in the Rocky Mountain sky! After the tailgate parties end, the big game begins! 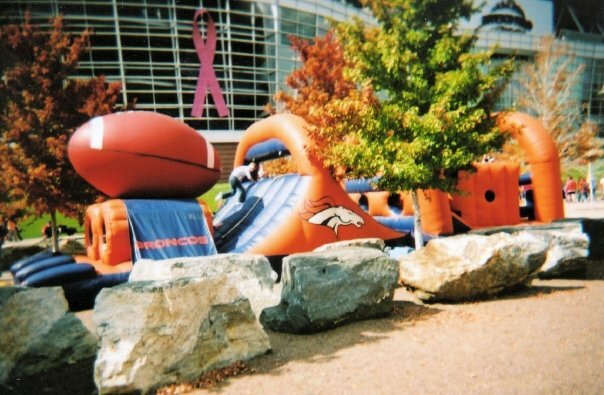 Some outside fun for the kids to burn off their pent-up energy while their parents get geared up to cheer at nearby tailgate parties. 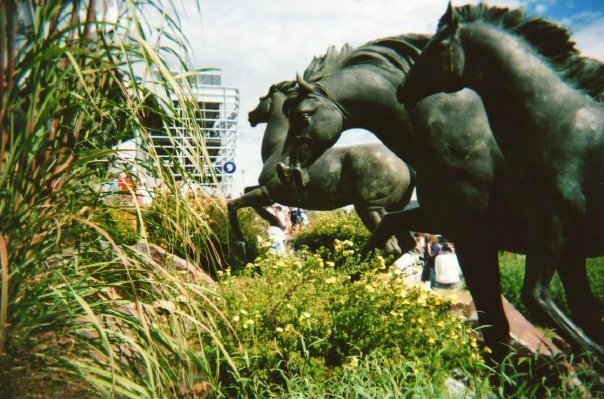 One last charge to bring home a win for the Broncos. For those who prefer seeing the sights from ground level minus the din of a screaming crowd, the 16th Street Mall is the place to go. Designed by famed architect I.M. Pei, the wide pedestrian pathway is just over 1 mile in length and is paved in warm hues of pinkish-red and gray. On closer inspection, you’ll notice a pattern that resembles the native diamondback rattlesnake. Whether you meander along the smooth snake-like surface on foot or choose to ride the transit shuttle system, take your time and enjoy the sights and sounds. The corridor is lined with trees and is accentuated with row upon row of fragrant flowers. Nature is nicely juxtaposed against sleek skyscrapers offering a reprieve from the concrete giants. Department stores and trendy boutiques will appeal to the shopping hounds eager to sniff out a deal. For the architecture buffs, there are also historical buildings to view such as Union Station and the Paramount Theater. Street performers add to the colorful ambience providing ample entertainment with singing, dancing or acting. When you need to refuel, grab a java or bite to eat from one of 28 cafes and restaurants along the way to prepare yourself for more of what Denver has to offer. Modern sculpture outside of the Denver Museum of Art. 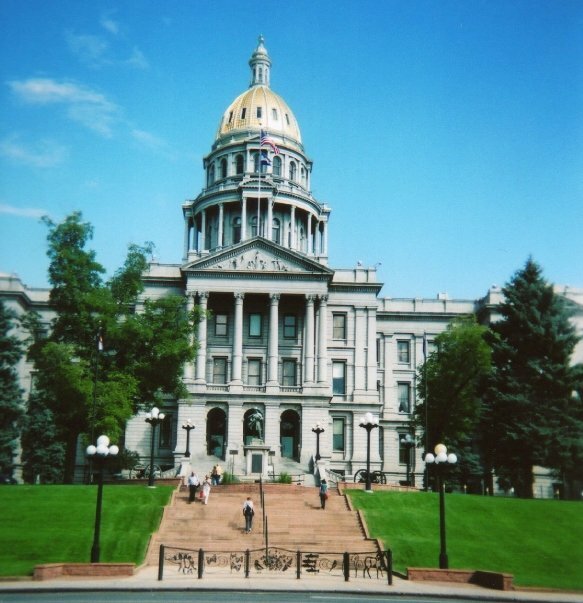 The Colorado State Capitol building stands tall in the Rocky Mountain sky. Interested in viewing a new gallery exhibit? How about a comedy act, or maybe the symphony or a Broadway play? Whatever your favorite pastime is, chances are good that you’ll find something going on around town that appeals to you. The Denver Art Museum is a mix of classical and modern architecture/sculpture. Comprised of two buildings – one low to the ground and sturdy like a fortress, the other soaring high in the sky and delicate with shards jutting out to resemble a titanium crystal – even before patrons enter they are treated to an eclectic visual experience. Inside, the museum boasts the world’s largest collection of Native American art, impressive holdings of European and Old West classics, and also hosts major traveling shows throughout the year. Denver is the cultural mecca of the Rocky Mountain region and there are plenty of show venues to choose from. 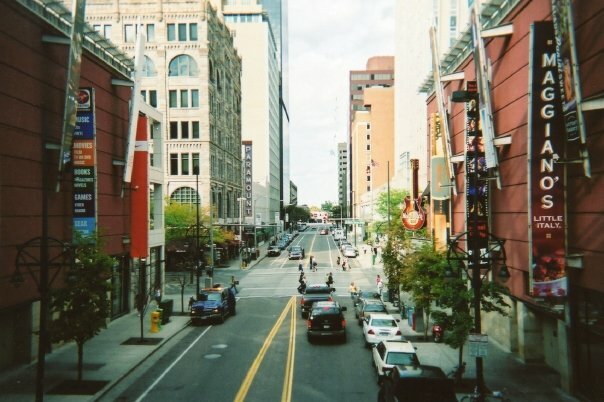 The modern Denver Performing Arts Complex, which is comparable in size and scope of entertainment offered to New York’s Lincoln Center, is the main hub of activity. Located downtown, the Arts Complex is the home of the Colorado Ballet, Opera Colorado, the Colorado Symphony, and the Denver Center for Performing Arts. The historical Paramount Theatre in downtown Denver. If you are most at home in the great outdoors, there are over 200 parks within the city limits and even more on the outskirts that are easily accessible and widely used. This makes for luscious green spaces that are especially inviting when the city is not in the grips of old man winter, but are nonetheless available year-round for those who aren’t afraid of a little snow and cold. One of the most popular gathering places is Confluence Park, where the city of Denver was first established back in 1858. From its humble beginnings as a gold mine camp, the river setting was an ideal spot to stake a claim. The gold is long gone, but it has been replaced by a swath of green. Denver’s 850-mile long bike trail network runs through the heart of Confluence Park and will take you along scenic routes to most major attractions around the city. 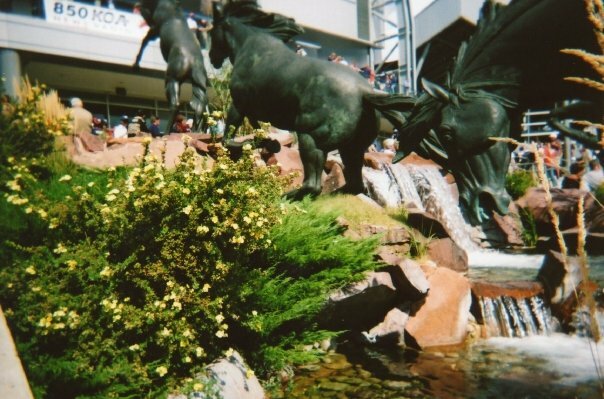 Fans of flora and fauna will want to visit the Denver Botanic Gardens and the Denver Zoo. With 45 gardens to choose from and an incredible array of 33,000 plants to marvel over, the Botanic Gardens are like a piece of paradise to unwind in. 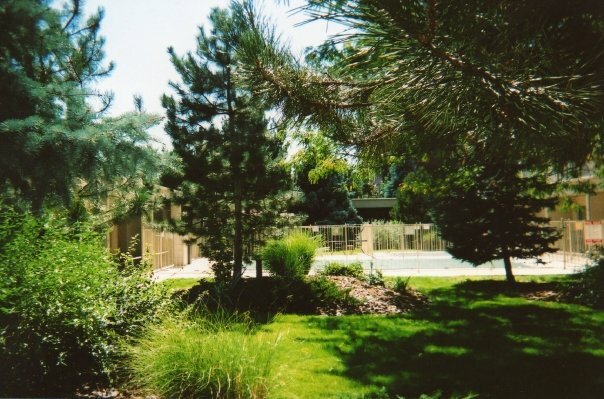 For its part, the Denver Zoo ranks as the fourth most popular zoo in the United States. Experience the dry and open plains of Africa, the lush tropical rain forests of South America, or the northern frigid shores of the Arctic as you interact with wildlife from these regions. A local downtown hotel brings nature into the city in its inner courtyard. 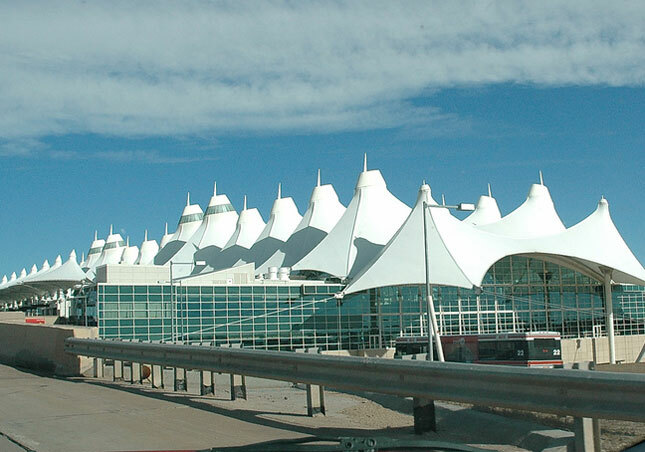 Not only is Denver International Airport a spectacle for the eyes from the outside, it also has spectacular delights within. The most striking facet of the exterior is the white Teflon-coated roof that appears to be a long stretch of snow-capped mountains, similar to the Rocky Mountains that are a short drive away. The airport’s design is both aesthetic and functional. 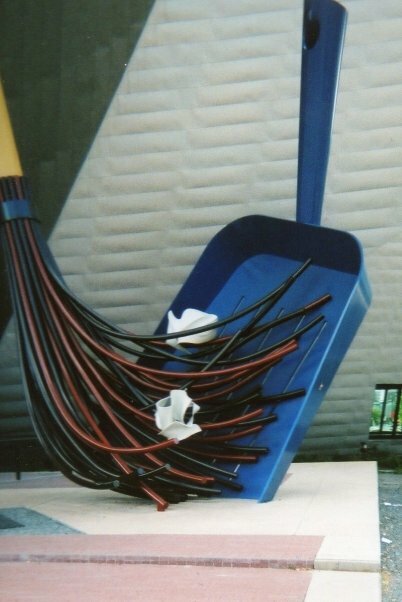 It provides striking scenery from the air and ground, and the sloping non-stick canvas prevents snow from piling up on the roof in the winter months. Is it an airport or a snow-capped mountain range? 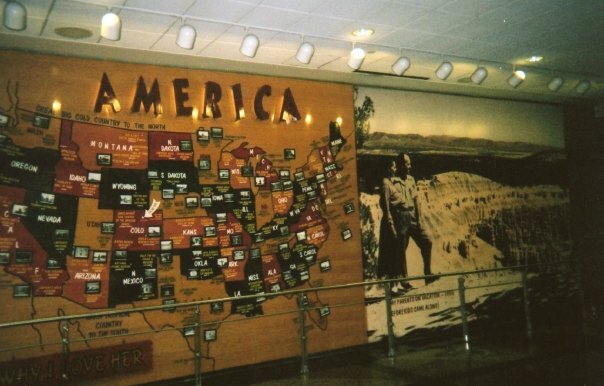 Emulating the fine form and function of its roof, the airport’s interior is decorated with a series of educational murals paying tribute to the deep history and rich diversity of this part of the American heartland. Feel your heartbeat rise as you stand in awe at the edge of wide and deep cavernous canyons with explorers from the past looking for adventure of your own, or mop the sweat dripping from your brow as you follow along dusty trails with the pioneers who settled the land in search of gold and a place to call home. It was intrepid spirits and weary travelers like these who found what they were looking for and laid the foundation for future generations of John Denver “wannabes.” For those seeking a Rocky Mountain high of their own, Denver is the perfect city to launch a quest of personal rediscovery from, so fly on in to start your journey! 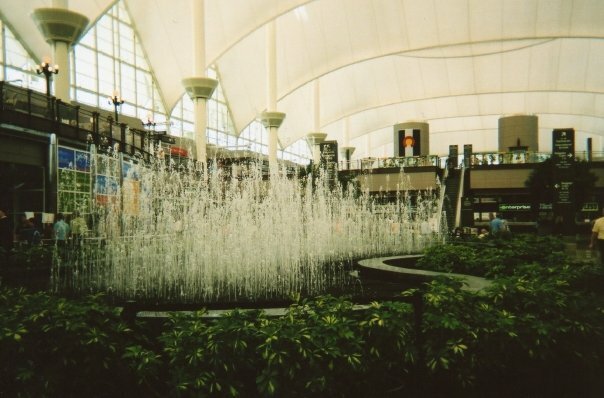 The Denver Airport is as pretty on the inside as it is visually interesting on the outside. Just one of the many murals inside the Denver Airport that is both decorative and educational.